A one-of-a-kind tribute collection takes us through the legal journey of former Supreme Court of Canada Chief Justice Beverley McLachlin, by bringing together the thoughtful reflections of more than 30 expert observers, illuminating a wide range of aspects of the Chief Justice’s legacy. 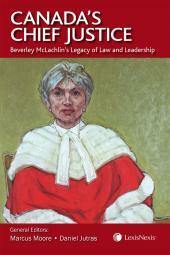 This one-of-a kind tribute collection offers the scholarly perspective on the legacy and contributions of former Supreme Court of Canada Chief Justice Beverley McLachlin, by bringing together the thoughtful reflections of more than 30 expert observers of impressive pedigree and diverse personal and intellectual viewpoints, illuminating a wide range of aspects of the Chief Justice’s legal journey. The collection includes words of personal appreciation and accolades from former heads of the Canadian government and top leaders of the Canadian, American, French, and English bench, along with analytical papers reflecting on the Chief Justice’s legacy and influence organized around four themes of recognition: Leadership, The Canadian Idea, Harmony, and Judicial Virtues. The volume is filled with photos of key moments of Chief Justice McLachlin’s life journey, and includes the full unedited transcript of an exclusive wide-ranging substantive interview with Her Honour. 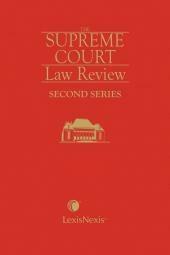 Plus, various resourceful tools including a bibliography of the Chief Justice’s speeches made during her tenure (2000-2017) and judgments as a justice of the Supreme Court (1989-2018) accompanied by scholarly analysis. 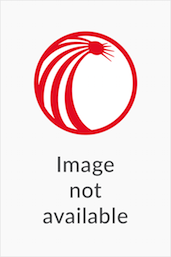 Volume 87 includes the collection of papers under “Harmony” and “Judicial Virtues”. Marcus Moore is a Clarendon Scholar at Oxford University and Assistant Professor at the University of British Columbia’s Allard School of Law. He holds degrees from Harvard University and McGill University, where he was the Gold Medalist and graduated from the Honours Thesis program. Marcus is a former law clerk of Chief Justice Beverley McLachlin at the Supreme Court of Canada. His research is published in leading national and international law journals. A former draft pick of the NHL’s Pittsburgh Penguins (retired due to injury), he mentored his two younger brothers to Harvard and the NHL, and is the author of two prize-winning books on ice hockey. Daniel Jutras joined the Faculty of Law, McGill University in 1985 after clerking with Chief Justice Antonio Lamer at the Supreme Court of Canada. He served as Dean between 2009 and 2016 and now holds the Wainwright Chair in Civil Law. From 2002 to 2004, Professor Jutras was the Executive Legal Officer of the Supreme Court of Canada, under Chief Justice Beverley McLachlin. Over the past five years, he was appointed twice by the Supreme Court to act as amicus curiae in landmark cases in public law. Daniel Jutras is Advocatus Emeritus and a recipient of the Merit of the Bar of Québec. Jean-François Gaudreault-DesBiens, Vanessa Ntaganda, and Noura Karazivan – The Rise and Fall of Freedom of Expression in the McLachlin Court?